The cowboy ain’t no lumberjack, an’ if you want the facks, One thing he ain’t the fondest of is choppin’ with an axe. But when December snow has got the range all wrapped in white, There is one job of choppin’ that he seems to like all right. A sharp ax on his shoulder, he will ride off up the draw Until he finds an evergreen without a single flaw. A spruce, a fir, a juniper that’s shaped just to a T To set up in a corner for the ranchhouse Christmas tree. As like as not, last summer while a-ridin’ after cows He noticed just the tree he wants, with green and graceful boughs That’s stout enough to ornament without no droop nor saggin’, But still a tree that ain’t too big to fetch without a wagon. It may be that he picked it out when August sun was hot, But he knows where to find it, For his mind has marked the spot. It ain’t no chore to chop it down, an’ if the snow is deepHe drags it in behind his horse. It warms him up a heap To see them rancher kids run out a-hollerin’ with glee To watch him an’ admire him when he’s bringin’ the tree. 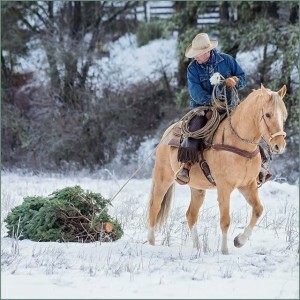 Them kids may not belong to him, but that don’t matter none— His boss’ brood, a nester’s brats— It’s still a heap of fun To some ol’ lonesome cowpoke, an’ it sets his heart aglow To come a-draggin’ in the tree across the Christmas snow. Sometimes when there’s a schoolmarm an’ she wants a tree at school, She gets half a dozen. for you’ll find that as a rule At least that many cowboys, in sweet education’s cause, Will somehow get to feelin’ That they’re kin to Santy Claus!